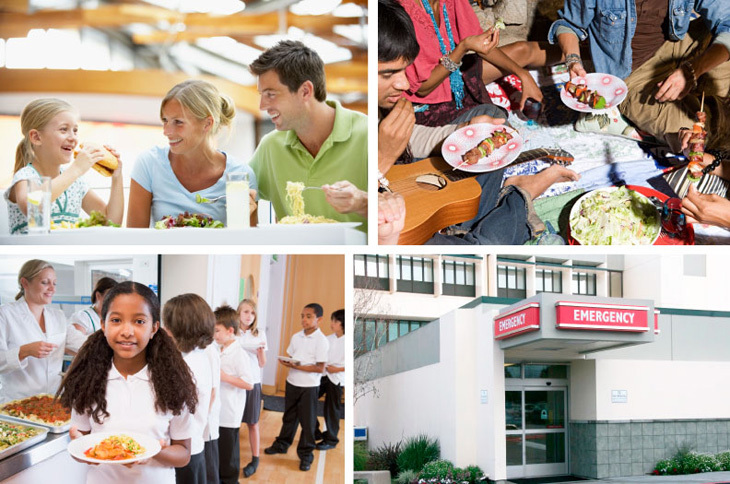 Most of the largest outbreaks we track come from contaminated food that results in many foodborne illness cases across the country, but it’s important to understand that restaurants, public picnics and other food establishments run the risk of large-scale foodborne illness outbreaks when they handle contaminated food improperly. Three people were hospitalized with Salmonella Montevideo infections after eating at Denny’s in Rochester, Minnesota. Health officials still aren’t sure how the bacteria entered the restaurant, but they required Denny’s to discard all potentially hazardous foods, sanitize all food prep surfaces, and enforce the no bare hand contact rule with food. As a result of eating food at a picnic at Neff’s Lawn Care in Germantown, at least 75 individuals have become ill with E. coli. A 73-year-old man has died and a 4-year-old remains in serious condition. At least 60 people are hospitalized after eating a turkey dinner at the Denver Rescue Mission. Turkey, mashed potatoes and vegetables were served at the dinner, but health officials don’t know yet which food is the source of the outbreak. Two people have died and 3 others have become ill in a listeria outbreak believed to have originated in food served at a hospital. The contaminated food appears to be Mad Butcher salami and pepperoni rolls. The remaining products were recalled from other retail outlets before more individuals became ill.
Salmonella found in eggs has sickened 500 schoolchildren at a school in Thailand. All 500 were hospitalized, but 367 have already been discharged, and 127 are still in the hospital for septicaemia, which requires the strongest type of antibiotics. A 17-year-old schoolgirl suffered from shock due to severe septicaemia and low blood pressure. Lab tests confirmed that the diarrhea had been caused by Salmonella. It’s estimated that 300 of the 10,000 eggs donated to the school had the bacteria. Outbreaks can happen anywhere, anytime. These 5 outbreaks could have been avoided if proper food handling and cooking procedures were followed. All food establishments should assume they are handling food that has harmful bacteria. That’s why it’s important to always follow proper food safety practices to make sure the food served is safe to eat every time. Don’t miss more tips and alerts for keeping food safe for your business or family on Respro’s Facebook page!